The stylish and versatile V90 is the latest in the premium car maker’s top-of-the-line 90 series, sitting alongside the award-winning XC90 SUV and the recently launched S90 premium saloon. Building on Volvo Cars’ indisputable heritage in the estate segment, the new V90 takes the premium estate a clear step forward in terms of aesthetics, materials and finish, while living up to the ultimately practical nature of any true estate. 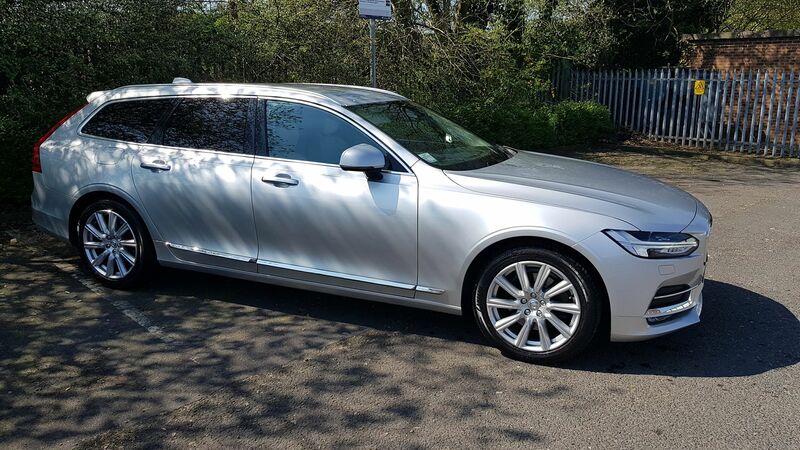 The high specification on the Inscription model means the V90 provides privacy glass, 4-zone climate control, heated seats front and rear and a 3-pin plug charge facility in the rear with the added option of USB connection. With a large cabin, with ample leg room in the rear Volvo design doesn't compromise this by deducting space for the large boot. The boot which can carry numerous large cases and hand luggage creates a perfect vehicle either for the family holiday or overseas visitors to the UK. The Volvo V90 is also fitted with a number of additional safety features including automatic braking and collision avoidance.